Aiming to reduce the trash content returned to grading lines, Grimme has launched its new CleanLoader. Grimme claims its CleanLoader has a maximum output of 120 tonnes per hour. Crop is pre-cleaned in the field before being transferred into a trailer for transport to static grading lines. The loader features tandem axles and a drawbar allowing it to be towed to the field by a tractor. Once in-field, the on-board four-cylinder, 62hp diesel engine takes over to provide all hydraulic and electrical power to the rig. At the front end of the machine is the firm’s 21cu.m RH24-60 receiving hopper, which feeds onto twin coil separators to remove soil from the crop. A short double-sided picking table with two trash conveyors are fitted as standard, with two belts transferring the crop onto the elevator. 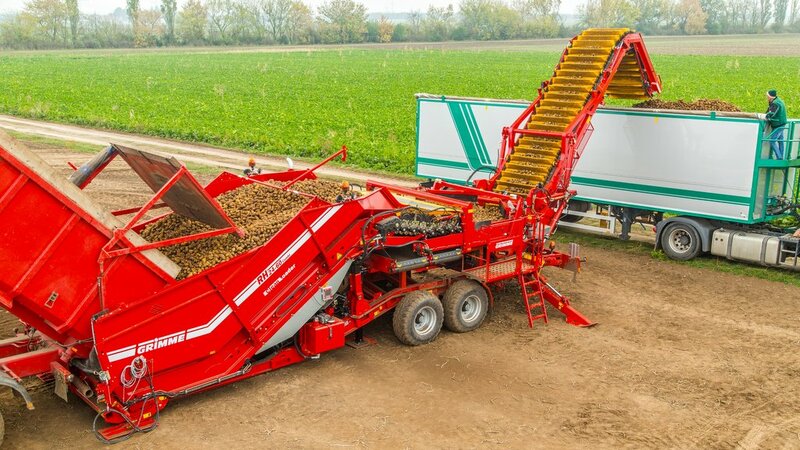 Measuring 120cm wide, the pivoting elevator allows 6.5m of movement at the discharging end, which can reach to a maximum seven meters, allowing the trailer to stay out of the field and avoid dragging soil onto the road. A swan neck design allows the elevator to place crop in the bottom of the trailer while maintaining its 6.5m load over height.